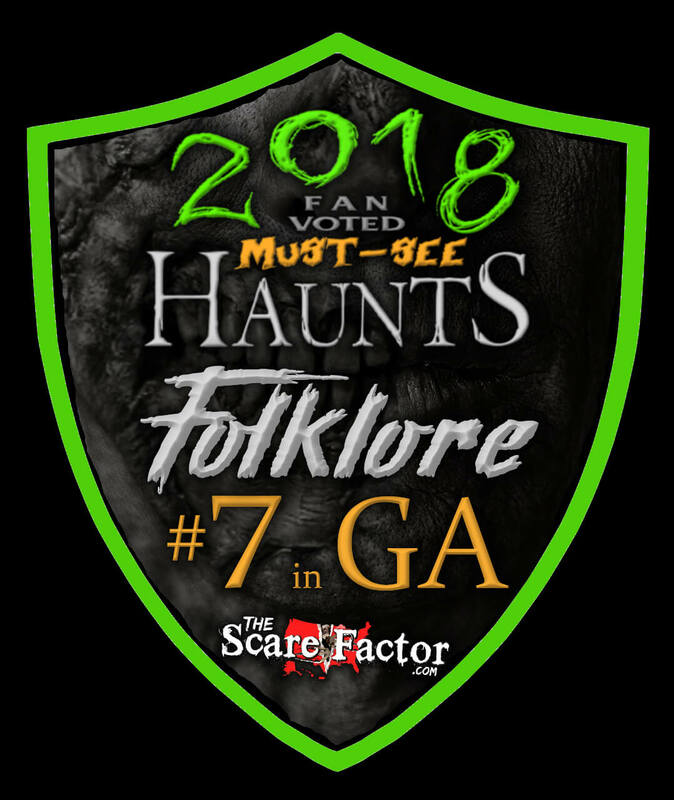 Folklore Haunted House is a Haunted Attraction located in Acworth, GA. Team Jefferson Starship reviewed this attraction on September 23, 2016. 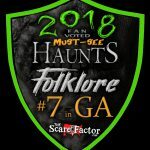 Folklore Haunted House is relatively new to northwestern Georgia, but they are a welcome addition. If you’re looking for a fairly traditional haunt with some creative twists and strong character interaction, then you’ll be talking about Folklore for ages. Folklore comprises three haunts: the Manor, Tremulous, and Chromophobia. Folklore also features an experience known as The Last Ride. Team Jefferson Starship was lucky enough to visit Folklore on an early pre-opening night event; as such, Chromophobia and the Last Ride were not yet open. This review will focus on Tremulous and the Manor. The cast at Folklore really shine. You won’t actually see very many of them, but they are a solid cast of characters – each recognizable, distinct, and always on point and in character. There are actors who work the lines outside as well as actors inside. Jiggler the Clown, Lady Death, and the demon girl outside were fun to interact with. Inside Tremulous, the archaeologist whom you initially meet was very convincing and helped to set the mood for the attraction. The poor victim on the bed in the Manor was also very good. If there is anything that could be improved in the Cast of Folklore, it would be to see more of them. There are a few spaces throughout the haunts that were open and vacant; if actors on par with the rest of cast could be found to fill those spaces, it would be a great addition. The attention to detail on costuming at Folklore was very very good. Make-up was used to good effect and all the costumes were authentic in appearance. The archaeologist at the beginning of Tremulous, again, is a prime example of this. You don’t have to be introduced to him; one look at him and you know who he is and what’s going on. There are few masks at Folklore but the ones that are utilized are done well. The make-up was good and the only suggestion we could offer would be to continue to improve techniques and to outfit the actor(s) behind drop-panels to better effect. Folklore is at a rather unique location and the roads there can be a bit tricky. However, there are a few signs on the road pointing the way and the location is well lit. Stronger signage at the lot might make it easier to locate, but could also take away from the feel of the unique setting. Employees are friendly and approachable and willing to help. The parking lot looked to be fairly small, so plan to get to Folklore early so that you can grab a spot. There were plenty of spooky sounds and haunting strains of music wafting through the outside waiting area which is where the queue actors greet and stalk visitors. Plan to spend some time hanging out here so that you can meet all of them at least once before you head to the indoor waiting lines. The outside of the building seems fairly plain. It clearly resembles an abandoned building of some sort – a school? a dormitory? a hospital? – but it doesn’t truly scream Haunt. However, the indoor queue lines are decorated to off-set that, giving visitors time to get in the mood before entering each of the haunts. The special effects across both of the haunts we visited were typically used well. Many of them seemed to be standard props, but there were some that were clearly reworked and repurposed to specifically fit in with their respective settings. There are lots of little details that serve to immerse visitors into the setting provided by each of the haunts. In the Manor, these can be seen throughout – from walls to floors to props and scenery. Inside Tremulous, be sure to keep an eye out for a gigantic god of Death, a hideous serpent, and then the final staring horde that you must brave to escape. Overall, however, we found both haunts to be a little too well lit; some areas with a bit more darkness would have increased the feelings of disorientation and terror. The giant serpent seemed to growl rather than hiss. Each of the two houses diverge somewhat on this aspect. The Manor is an old-school haunted house with a variety of traditional scenes and scares, while Tremulous was a descent into archaeological madness that should not be missed by any haunted house lover. However, that means that the Manor doesn’t really stick to one particular theme other than classic horror scenes. Tremulous however really shines as an example of how a haunt can take a theme and include a variety of different scares and different elements while still maintaining a cohesive story across the haunt. We also love that, for both haunts, they only send through very small groups – it seemed that perhaps four people was the max, but even then, they prefer to split that up into groups of two. Smaller groups make it far easier for actors to personally interact with visitors, for jump scares to be effective, and to let the feelings of isolation get a grip. There were a variety of scare types across both haunts, but with fewer actors, a lot of the scares were prop-driven, which means somewhat predictable. Both the Manor and Tremulous exit into the same hallway, which was a feature that we both enjoyed because it adds to the distraction, but also found a little confusing when we were navigating through. The finale for Tremulous was also very well done. We don’t want to completely give it away, but it was quite unnerving. On a normal evening, the Manor and Tremulous are $15 each, which might be a bit much for how short they are individually. However, a combo ticket at $25 gets you into the Manor, Tremulous, and Chromophobia. For $40, you get a fast pass for all three, plus a journey on the Last Ride. Assuming that the same level of detail is given to Chromophobia as to the two haunts we did visit, that price tag can’t be beat. An experience that plays with 4 out of the 5 senses. You forget the real world exists when you pull …show more in the gate at Folklore. I had a wonderful time and cant wait to return this year to see the new screams they have for me.